Ah, but it's hard keeping up your yoga practice (not just on your mat, but out in the world where it's supposed to be) in your ordinary life where children forget to give you letters from school and then you must rustle up a project on Victorian Toys in an evening and out of what you can find lying around the house; and someone who is probably late for work (or just cross) sits on your tail all the way to school and you drive all the way there trying to find compassion for them and resisting the temptation to drive v e r y s l o w l y so that they back off and leave you alone, or overtake you and get on their way; and there are distractions everywhere you look; and people can be... well, just annoying sometimes, and hard to love! I've been thinking about ashrams and retreats and how wonderful it would be just to practice all day long and to have time for your little break-downs and moments of self-doubt, without trying to have them while you're cooking fish fingers for supper and listening to the simultaneous stream-of-consciousness ramblings of a 9 year old girl and an 11 year old boy. How wonderful it would be to find your way to your yoga mat for meditation every morning to practice without feeling remotely conflicted (I ought to do some laundry). Or to get down to some asana practice that lasts as long as you want it to and is not curtailed by the need to be somewhere at some time. But life is here to teach us and it is in the fire of life that we test our beliefs and convictions. And I am here on this earth as a mother and my children are a gift to me (some gifts are challenges too) and the times that I find myself wishing I were somewhere else, somewhere peaceful are very human moments. I am reminded of Leonard Cohen, who spent some time as a monk, and who said that all monks know that they have failed because they are unable to live in the real world and I think I know what he meant (although I don't know if I agree with him - I have never been a monk), but it is easier to find peace and stay with it when there is less of the world around to bother you. When I have been on retreat I have been focused and at peace and undisturbed from my practice and it has been joyous. It is a gift to myself to feel this way and I will make sure that I give myself this gift more often in my life. But this body is where I live and this practice is what I have. It is what it is and what it is is wonderful and positive and transformative and clarifying and it has helped me in ways that I might have expected and ways that I haven't. 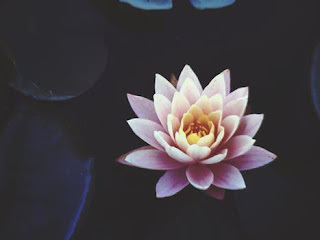 It is better to live your dharma badly, than to live someone else's dharma well, says the Bhagavad Gita, and the futility of wishing your life were (just a little bit) different is obvious. We find our peace where we can. We aim to give our love continually to everyone. We make a corner of our bedroom a little sacred ashram space and we commit ourselves to going to that place every day, for as long as we have, to renew that vital connection, to refresh that centred peace. We turn a dog walk or the baking of a cake into a mindful practice of grace and gratitude. It's life. It's what we can do. And we make ourselves into yogis and yoginis both on and off our mats, rather than thinking things have to be or look a certain way before we practice. In this way we set ourselves up to succeed, rather than to fail and we take the gift of yoga as we find it and how it really is.